Good Morning. I hope everyone had a lovely weekend. Around these parts we said good-bye to Daddy who headed to the UK for the week for work, the sun shone warmly enough that I can see a smidgen of grass around the edge of the yard (there is still about seven feet of snow in the middle of the yard, so I am not fooled into thinking spring will be here anytime soon) and we had two movie nights watching The Sound of Music - it was so fun to cuddle on the couch and watch this classic with my girls. I am also happy to report that I am finally feeling better after the worst cold in my history. This weekend also saw a bit of progress on the crochet front, specifically my crochet cushion which I first told you about here. I finished all the squares for the front a few weekends ago, while still in the throes of nose-blowing, and on Saturday I blocked the entire thing together. I also worked on the backing of the cushion. At first I was going to make one large granny square, with each round a different color, but I was not happy with the shape my granny square was taking (it was turning out a little wonky rather than square, even though I started each round at a different corner) and I did not like how open it was and how much the underlying pillow form would shine through the spaces between the rounds. So I scrapped that idea and decided to make a more solid backing - double crochets back and forth to form a very sturdy and dense fabric. I like this much better. By Sunday afternoon, the front of my cushion had dried from blocking and I began to sew the squares together - this went much faster than I had first thought it would. 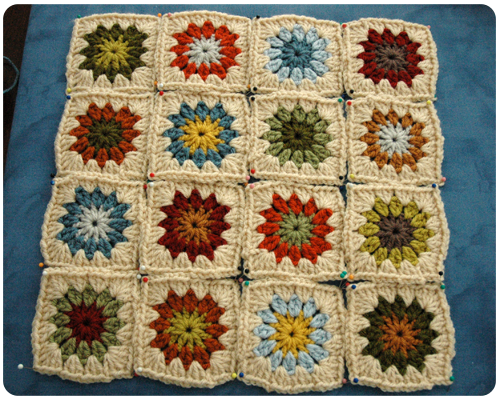 Maybe I was still a bit put off by all the sewing together needed for my Garden Patch Granny Afghan.....for no good reason for this is much simpler. 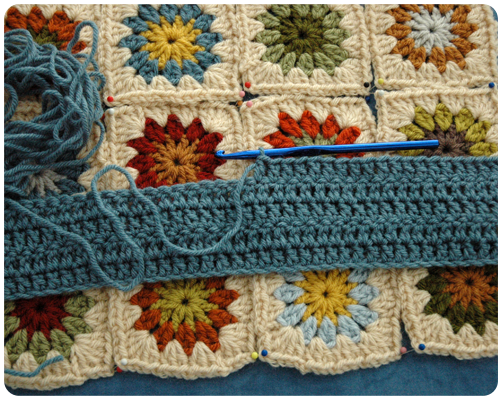 And while we finished up The Sound of Music on Sunday night, I worked a little more on my backing....row after row of blue, though I may throw in a few other colored rows just for fun. It feels really refreshing and engaging to have a larger project to work on again. And I am thinking of so many other cushion ideas so there may be a few more of those in my future. Hope your weekend was well and that you got a little crafting done. Love how your cushion is shaping up. Can't wait to see how many coloured stripes you add to the backing. 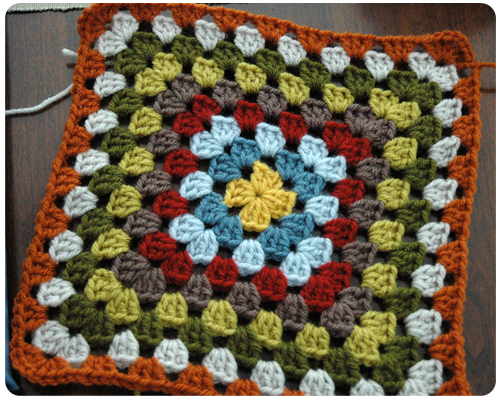 I'm still learning new things crochet wise and making good progress with a blanket. I'm finding it so relaxing the hours just drift past. Thanks for your inspiration!!! Oh Jane...you should see the stripey loveliness that I worked up for the back of my cushion. I am so happy with it and will share it here soon. Thanks so much for reading and best of luck with your blanket..I can hardly see what it looks like. Very pretty. So talented. I wish I had the patience to crochet.